We began convention with one of the most profound liturgies of Listening led by the Bishops, with repentance on a wide spectrum ranging from negligence to collusion in practices that were dehumanizing of siblings of every gender in our church. I am sure this liturgy in many ways shaped the way the House of Bishops engaged the rest of Convention. 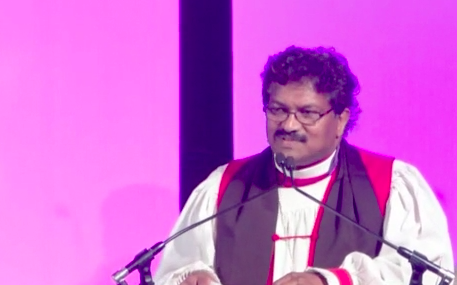 I heard some genuine truth-telling and could not but pause to thank God for the leadership of Presiding Bishop Katharine during tumultuous times in the life of this church. It was more than emotive and indicative of the healing that comes from genuine Christian vulnerability. The opening Eucharist, when our Presiding Bishop Michael called us to throw ourselves into the embrace of Jesus and keep our eyes on the Gospel (prize); the Revival was unreal with terrific music, a packed crowd, and yet another enlivening and riveting sermon that was rich and effervescent to all including visitors! When the Diocese of Cuba, which was “kicked out” (Resigned Bishop Leo Frade characterized it that way) by the House of Bishops over fifty years ago (1966) was welcomed back. It was a powerful moment! Bishop Griselda Delgado del Carpio was visibly moved to feel the breath of the Holy Spirit as she was seated at Table #7 with her colleague Bishops. A similar move was cherished in the House of Deputies. Our church is better for it. When both Houses agreed on a meaningful way to compensate the ministry of the President of the House of Deputies through a director’s fee for fulfilling her Canonically and Constitutionally required duties without changing our polity, and more importantly keeping our focus outwardward on missional ways of becoming beloved community. When the three joint meetings of the Houses on Racial Reconciliation, Creation Care, and Evangelism were right on the mission! The one on the budget, of course, was right on the money, at least 15 million of which we did not have. When our Deputation had substantive interactions and quite a few opportunities (at least six that I was able to attend) to gather, process and encourage one another. We worked very hard and well together. Billy was terrific in bringing us together in creative spaces! Wyles was a real sport! We even had glimpses of World Cup soccer. When we heard the good news that our Lego Love project in partnership with the Diocese of Costa Rica received the grant award ($61,875!) to build the school/community center in Cartagena! Thanks to Deacon Steve Robb and his team for persistence (we were turned down last year). The United Thank Offering from around the church for the 2015-2017 triennial brought in a total of $3,738,989.47! When we had a way to gather for prayer to learn about aspects of gun-violence every morning; distributing 96 crosses every day to remember that on average 96 people are killed due to gun-violence. When nearly a thousand visited the T. Don Hutto Detention Center to express our solidarity with mothers and others held there. A way to engage the Prayer Book without being distracted by a monolithic revision process around one book for the next twelve years. I think we are moving as a church in the practice that Jesus is reviving us through prayers in our Prayer Book as well as through other authorized resources of equal significance with Episcopal oversight. I am particularly interested in launching the resource of a liturgical hub in the next liturgical year to curate dynamic and transformative liturgies for our congregations. Agreement on marriage as a God-given responsibility for all and affirmed established trial liturgies with Episcopal oversight made available for all. Unanimously welcomed back into the Episcopal Church, Cuba! Si! A mixed bag of resolutions on Israel-Palestine; we named the log in our eye when we discussed the irony of child-safety in our culture with such a high level of our children’s vulnerability due to normalized school shootings and more. Welcoming Church of South India congregations, and continuing Episcopal Church-United Methodist Dialogue. Investment of resources to enhance racial reconciliation, creation care and evangelism. There is a lot more that emerged from interactions with those who are familiar to us and those who are not. That’s the gift of General Convention when the church unites to pray and discern how to be for the foreseeable future. I was thrilled to have Roja join us for the latter half of Convention. She had a powerful experience visiting the Community First Village in Austin that mitigates homelessness in a creative and dignified way. After Convention, Roja and I visited a Presbyterian Pastor, now retired in San Antonio, who was instrumental in having us come to the US for higher studies. This was a very humbling and joyful time for us. Without his initiative, we would have had neither the courage nor the resources to get over to the other side of the globe and start this new journey as new immigrants in the united States 25 years ago. It was a blessing for us and fitting to spend time with this now physically frail and spiritually alive leader. In a word, it is all about the love we share in Christ Jesus!